Unlike traditional reservoirs, INTEGRA developed an innovative reservoir solution that features reusable reservoir bases. This allows users to reuse the sturdy base and toss the disposable insert. INTEGRA reservoirs have been designed to nest inside each other, making it possible to get twice as many reservoirs in half the space of other products on the market, reducing inventory space requirements and shipping costs. Unlike traditional reservoirs that have hard to see graduations molded directly into the plastic, INTEGRA reservoirs are made of crystal clear polystyrene and fit into a reusable base with bold, crisp, clearly visible graduation markings. The unique design leads to more accurate reagent measurements, no over pouring, and less waste. 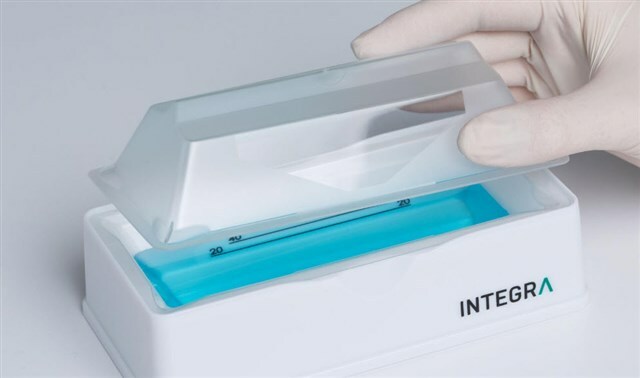 INTEGRA reagent reservoirs offer a convenient solution for the temporary storage of non-solvent based liquids during any pipetting application. The system consists of disposable, crystal clear polystyrene inserts that fit into reusable bases with clearly visible volume markings. Holds disposable reservoir securely during use. One free base is included with every case of bulk or individually sealed reservoirs. There are no threads in Integra Biosciences Multichannel Reagent Reservoirs Reviews at this time.